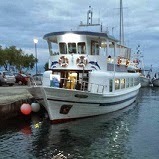 During the summer time and on daily basis Africana begins its cruises to Skiathos island. Africana is an outstanding boat, constisted of 100 seats. ~Cruise No1 Its departure is at 9.30 in the morning. From Platania sails near the coast of the morning. From Platania sails near the coasts of the south part of Pelion (Kastri, Katigiorgi) and moves on the exotic place Koukounaries of Skiathos. In this beach which is full-flourished and covered with pines, stays two hours long in order visitors to swim in this blue waters. The trip continues with a two hours visit in central Skiathos, where the guests may wander lengthwise the paved roads and treat themselves to something really relaxing, such as a coffe at the magnificent and famous castle, Bourtzi. Instead of the above callers may also visit Papadiamantis house, one of the most famous writers Greece. Provided that the weather is suitable for sailing , Africana directs to the northern part of the island and meets the breathtaking location of Lalaria and the Cave, parts of stimulating and incomparable natural beauty. Otherwise, if visitors do not have the opportunities mentioned above, Africana will take them a tour at Tsougria, where there have the chance to swim in the amazing blue sea, until the time of departure (17.30). ~Cruise No2 Every Saturday night, Africana start its journey at 19.30. It arrives at the little sinus of Chondri Ammos beach. There, visitors can enjoy the stunning sunset with friends and loved ones or accompained and enjoy your free drink. ~Cruise No3 PRIVE ONLY FOR YOU Last but not least, Africana is available for prive parties and events. ΗΜΕΡΗΣΙΕΣ ΚΡΟΥΑΖΙΕΡΕΣ ΚΑΘΗΜΕΡΙΝΑ ΑΠΟ ΠΛΑΤΑΝΙΑ N.ΠΗΛΙΟΥ ΓΙΑ ΣΚΙΑΘΟ.